Yes, I know, we are all in that ‘At Last’ mode today, it’s finally happened, I thought I’d never see it in my lifetime (well, this season, anyway), did I really just see that, what a relief, it’s a miracle. 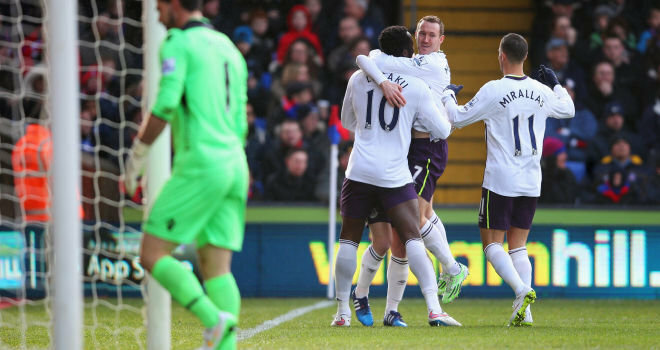 Yes, Aiden McGeady just played a full 90+ minutes in the Premier League for Everton. That might sound a bit harsh, and I’m even hedging my bets by not saying “the first time he’s played 90 mins” because I’m genuinely not sure of my facts (not usually an issue for journalists or faux journos like me), but yes, the lad played the whole game. And in my view, it was one of his best games in an Everton shirt. But more on that later. The relief at an Everton victory, at long last, was obvious. The manner of it was hardly convincing, and frankly Palace could consider themselves unlucky not to have equalised and even scored more in a frenetic first 20 minutes. But they didn’t, and one well-worked-if-scrappy-finish goal after barely 2 minutes was enough to secure a much-needed 3 points. And let’s hope, there’s that word again, the one that Evertonians have a love-hate relationship with, yes let’s ‘hope’ that it signals a turnaround in performances with a challenging February of fixtures ahead of us, not to mention all of the remaining 15 League games plus whatever we can conjure up in the Europa League. Even if we win every single League game from here, we’ll end up with fewer points than last season, so it’s now about consolidating the squad, the team, around a variety of playing methods that gets the best out of the dwindling players we’ve got, and the better of the opposition that have sussed out that we ain’t got much beyond Plan A. There are encouraging signs that the quicker ball up top, still mainly on the carpet is starting to get the best out of the front men, or more precisely ‘man’, and there were a couple of signs yesterday that McGeady is now willing to try and go outside his man and stick in that telling cross, so a hint of a Plan B.
McGeady has not to date been good enough to be labelled ‘an enigma’. Certainly he has spells of being enigmatic, but his downsides have to date outweighed his upsides by some considerable margins. The final ball, oh yes, the final ball, has always been lacking, and frankly not just the final one either. But at last we saw against Palace how good he can be. Three times he won the ball back in a dangerous position, and on one of those occasions his ball just eluded Lukaku’s studs for a certain second goal; on another occasion his curling effort for the top corner was just too close to Speroni; and then the final occasion he went for glory (I think) when a cut back was the order of the day. In those three moments alone, we could see the best, the worst and the nearly quite good, that we know is McGeady. If he could at least cut out the bad one of those three, then he’d be a decent player for us! Let’s give the lad our support, he has amazingly quick feet, so quick he befuddles first the defender and then sometimes himself, but we need a player like this to open up and get behind defences, especially when they sit back and defend and know full well that we don’t have enough guile to break them down. We need the trickery, we need the wing play, we need the tenacity to win the ball back, we just don’t need the blind alleys and the pass to an oppo. Joel seems alright doesn’t he? A couple of dodgy moments in the first half, but generally solid, and no more dodgy than Timbo has been on occasions this season. His shot stopping seems sound, his judgement improving, his positional play a bit odd (just wait for someone to lob him from within the area as his desire to close down angles leaves him a bit vulnerable to that), he still flaps at too many crosses, but his obvious growth in confidence is a delight to see. He’s also bulked out a bit I think, which is no bad thing as his weight and height bearing down on you will put off some forwards of that there’s little doubt. Whether he will cope with whatever Liverpool throw in to the mixer next week, time will tell….and then there’s a Costa-less Chelsea to contend with on a cold February night in SW London. Put it like this, he’s kept us in some games, he’s kept two clean sheets in a row now, and it hasn’t been his problem that we’ve had a pretty inept December and January. Good luck to the lad. I’m assuming Tim Howard will slot back in when fit, but if Joel keeps playing well, I suspect it may be a much harder selection decision than we might have assumed a few weeks ago. Heroes yesterday included a much more verbal Jags, a confident and exquisite Stones (still good enough to make up for his telling errors), a second half of Besic, and a not-bad-stay-behind-for-extra-training from Naismith, Barry and Baines. Then there’s Seamus. Oh Seamus. Wassup lad? His body language isn’t right for me. I often see him flailing his arms about and complaining because no-one has picked him out with a pass; I’ve seen him roast the likes of Cazorla (I think there’s a cooking joke in there somewhere, but probably not exactly PC; and the other form of roasting certainly isn’t PC nor suitable for my family readership…. ), I’ve seen him going inside and outside of defenders, but I haven’t seen much of this at all this season, apart from the flailing grumbling bit. He seems to have a high-pitched voice on the pitch, so you know when he’s calling for it, so perhaps that’s the issue – it’s only picked up by dogs in the street outside of the stadium, and not the dogs we’ve got on the pitch. OK – harsh to call our players dogs, and I don’t mean it actually, only trying, and no doubt failing, to be witty. One way or another, this isn’t the same Coleman of the last two seasons, and I can’t put my finger on why. But I’d certainly be surprised if he doesn’t leave in the summer – I think his head has been turned by the Mancs. I’d hate to see him go, but if he does, then step forward Ty Browning or Jonjoe Kenny, and we’ll pocket the dosh thanks. So, after a well-deserved break in the sunshine of Qatar, we’re now back on it. Time to give the neighbours a tonking (er, not very confident of that actually happening next week, but can’t deny it’s time we gave them one), time to squeeze a jammy point or three at Stamford Bridge, and then time to get back on the trail with Everton in Europe. I’m not one to suggest that all of our problems have been solved by one win, but it does make the mood seem brighter, and the future less daunting when you know you can squeeze out a win away at Palace, no easy task for any team. We have much to prove as the season progresses, and the proving starts at 5.30pm next Saturday.